I have officially switched from a summer camp teacher to an after-school program one. I’m entering week three for a couple of the classes and week two for the others. I slightly modified my first day of camp script and have added some dismissal procedures to the build ones. What I’ve really learned so far is that each of these procedures needs to be refined and adapted. There isn’t a one size fits all approach, especially when it comes to dismissal. I have been able to decide on a clean up procedure that works across classes though. When I started getting my program rosters for the first session of classes, I noticed an extra page for notes. This has been a very valuable way for me to jot down the specifics of changes that need to happen. For instance, I initially gave a class five minutes to clean up. They ended up needing a lot more. So I added to my notes that class ends earlier until their clean up gets speedier. There is another full class that is half kindergarteners. After a hectic first week, I was able to chat with my assistant teacher and come up with some options to make the next week run more smoothly. Those notes have also ended up in the provided space. I am afraid, though, because the student who needs this is only four or five years old. This is a pretty big class, and I don’t really have time to deal with tears. It is definitely part of meaning business so if I do this consistently and with everyone in the class, that kiddo shouldn’t feel singled out. For my own records, I would like to record the clean-up procedure I have decided on. First, I will clap to get everyone’s attention and announce that it is time to clean up. Students are expected to turn off their motors and start disassembling. I go around and collect them and put them back in my tool kit. Next, I announce that they should check the floor around their space to be sure all of their pieces are collected. If they think they are done cleaning up, they should raise their hand so I know they are ready. Then, students wait at their table for a teacher to approve the organization of their kit. The idea is that if they have not done it correctly, they need to fix it. Once their kit is approved by a teacher, and only then, students are allowed to put their kit in the storage box before lining up, waiting patiently, or helping others. How do you handle it when you forget to follow through? Any tips or advice to help me remember? Leave a comment below. Thanks for reading! Have you ever started something, but the goal ended up being a little too lofty? That’s exactly what I’ve done with this blog. I started out this summer studying to be the best teacher I can be ASAP (sorry, not sorry for the rhyme). Then, life crept in and I needed to get a job. Luckily, I found one quickly that would continue to help me on my quest. My studies lagged a bit, but I’ve done a decent job with keeping up with my reflective practices. The lofty goal was trying to consistently put out three blog posts a week. I need to adjust it a little. I started writing again to have a digital/virtual resource for my notes, research, and reflections. While I didn’t entirely lose sight of that, I let my lofty goal supersede it a bit. I’m putting the real goal here so I can always refer to it. Having this blog as a resource has worked out well in the past, and I’d like for it to continue to help me along my path. I recently finished my last camp of the summer and went to my first back to school/meet the teacher night. My final week was with Mrs. J at the rec center I had been at most often. We had a pretty large group of kids, but the numbers fluctuated anywhere between 17 to 21. There were five different sets of families, some friends, some familiar faces, and one with special needs. The kid with special needs was one of the familiar faces and, honestly, working with him on the second week was much easier than the first. First big improvement: he was doing a lot of the building on his own! If he needed help and didn’t get it fast enough (as in before he got frustrated), he would want to quit. I handled it in a couple of different ways. Once, I said that he could take a break and that I would be there as soon as I could to help him. Another time, I let him be done and clean up his build. He did really well during the builds not only because he seemed more interested but also because we found a kit that met his specific wants. He was super excited to have brown tires and a single black #2 axle in with all the red ones. Of course, there’s more to a summer camp than just the motorized lego builds so it wasn’t all smooth sailing. This little guy became obsessed with a Lego Magikus game. There was at least one day that we ran out of time for him to play, but we had some help dealing with that since the tears came after Mom showed up. He also wasn’t as nice playing the game with the other kids this week. We explained that the other kids are allowed to play, and it would be more fun to let them. I don’t know how long the games lasted but some of the other campers did try to play Magikus with him. He was happiest, however, having the game all to himself. The biggest trouble was on the last day during the bingo game. I made sure he got a card with the green ninja on it since that had been his request the previous week. He made more and more demands though and threw himself on the ground “crying” and red faced when we didn’t meet all of them. Mrs. J and I made a few concessions but then drew a line. Eventually, he calmed down and played the game. It may not sound like it, but I really enjoyed having that kiddo in camp. His parents seemed to enjoy it too because he’ll be going to the after school program as well. It gave me a glimpse into the life of a special education teacher. I learned what needs I could fill cheaply, what could (or should) be ignored, what to say to the other kids, and how to draw a line and stick to it. I made a blogging goal that was too lofty. To fix it, I’m just going to write when I want to because it furthers my true goal of study and reflection. Have you had a goal in mind in the past and realized that you lost sight of it? Or that you accidentally created an unrealistic one instead? What did you do? What do you think of what I’ve done? Let me know in the comments below. I’d also love to hear about your own experiences with a child with special needs. This kiddo didn’t come with a warning to us from his mother, a diagnosis, or medication. There were just specific things that he wanted and was vocal about. I could tell they were not just selfish demands but things I needed to do to help this kid adapt and the week to run smoothly. What was your first experience like? How did you handle it? Did you feel prepared? How did you feel afterwards? Please share with me in the comments! It’s been a crazy week working with 21 kiddos of a wide range of ages, ability, and familiarity. I had other difficulties as well that you can read about here. One thing I did finally do was offer up a couple of ideas I had that were a little more obtrusive to Mr. K’s style. The first idea was that we the teachers would choose partners for the students. This was a diverse group of builders, and I thought we could make our jobs a little easier by choosing partners for them. There were really only a few changes that needed to be made so most kiddos ended up with someone they’ve worked with before. However, since I made little post-it seating arrangements for everyone, there was no fuss. I think it went better overall, but there seemed to be the same few builders who took a lot longer than the others and needed more help. Still, there were no tears today. My other idea was a special case, which worked and did not work all at the same time. There was a boy in this camp who needed a lot of help and encouragement to participate in the motorized build activity that is the main focus of these camps. He always wanted certain things, to sit in a certain place, and easily cried or threw himself on the ground if things didn’t go his way. I’ve learned that students like that need an incentive or reinforcement. If the behavior we want is that he builds his dinosaur, then there needs to be some kind of reinforcer for that behavior. The neat motorized dinosaur at the end is not incentive enough so there needs to be another. One of the things he has wanted all week is to build a car. So, today, he worked by himself and was told that if he built his dinosaur, he could then build a car. He definitely still needed a lot of help and attention but there was also an increase in initiative. Plus, after the build was done, and I said he could build his car after the dinosaur was put away neatly— wow! That dino was gone! Free building with the motorized kits has come up before as an idea, and it’s something I would like to keep in mind for future use. It seems like quite the incentive. Do you know students or other kids who need reinforcement for certain behaviors? What do you use? What has worked? What has not? Let me know in the comments below! Holidays are the worst for me when it comes to just about any work or productivity. A week off from scheduled (paid) work has now meant nearly two weeks off from my more personal pursuits. One year, when I took a single online class, there was a holiday late in the semester. The holiday happened to fall on the day I would normally do my school work. Because of this, I actually forgot to go back and finish the class! Luckily, I still got a grade (and a B at that). This was a while ago so I obviously still need to work on it. After a conversation I had with my husband the other day, it’s also obvious that I need to stick with my writing and reflecting. So instead of kicking myself for not doing so, I’ll just jump right back in. I mean, that’s how it happened in the first place, right? Anyway, moving on. A couple of weeks ago, I got my feet wet in running my own camp. I went in as prepared as I could be but still ran into a few issues. I wrote about that other places. This post is about this past week. Luckily for me, it was the same theme as my solo-run class so I already had some neat things prepared. I had the “Who am I” riddles ready to go, which was nice since I could show my boss some of my own style. I also had the dinosaur word puzzles for kiddos to do during the station play. There were a few more takers this camp but only a few. The puzzles were still nice to have handy. The hugely different thing about this class was the size. We’ve had 21 kids to work with this week (three times the amount I had before)! There are things that I would do differently if I were the lead teacher or working alone. There are things that I should have done, which I forgot to do. And, there are things I wish I didn’t do that I’m unsure how to fix. Because I’ve been studying, I understand how important it is to practice procedures and do them again and again until they become routines. The routines for this past week have been Mr. K saying the same things over and over again with very few kids listening at all or for very long. This total repetition of instructions and disregard for the teacher(s) has led to the thing I wish I didn’t do. There were several times where I had to yell to be heard and snapped at students because they were not following directions. I mean, their behavior has been mostly allowed so it’s not like it’s totally their fault, right? That’s what I’m unsure how to fix. I don’t want to snap at students, and I definitely don’t want to yell, but if the volume keeps rising and no one is listening, what else can I do? Another thing that should be a proper procedure to routine is the rhythm clam many teachers/schools use. Mr. K usess it to call attention and for transitions both. He doesn’t wait until people are listening before he starts talking. Students are allowed to continue with their own thing or not listen because he doesn’t insist on their part of the procedure. Because of this, they waste their own free time. However, it becomes our problem when transitions are slow, or we’re running behind. It is highly frustrating. I already know what I would do to fix these things mostly, but that is only if I can take the lead or am working alone. How do I adjust and adapt when someone else is in charge? I need to support the lead teacher, but I don’t want to spend all day repeating myself. I think that may be what I’m stuck with for now. I got so distracted in how things were going that were out of my control, I forgot about the things I can control. What I can control is myself. I can control how I act, how I feel, and how I handle situations. I already mentioned snapping and yelling. I also need to remember the idea of “praise, prompt, leave” when it comes to helping builders. There were many kids who were those helpless handraisers, and I did more to reinforce that behavior than change it. Next time, I need to work the crowd a bit more and remember to prompt and leave a little more as well. It’s not always possible when builds get tricky, but I need to remember to use it as much as I can. Have you been in a situation similar to mine? How did you deal with it? I’d love to hear any advice, tips, or feedback you might have. Please, leave a comment below. If you’ve been reading, then you know that I had a chance to teach on my own this past week. (Or, you know, some week in the past.) I had a great group of kids and really enjoyed it. Here are some reflections on what went well, what didn’t, and what I might try next time. I really think that my first day of camp script went over well. I felt prepared, and I was able to share everything I wanted to right away. There were some procedures that we didn’t stick to very strictly because they weren’t really needed. Hands raised versus hands on heads was one. I reminded the guys of the procedure the first couple of days but then let it go since the group was so small. Another thing I enjoyed, that I know the campers did too, was providing a guessing game on that day’s build. On the board each day was a “Who am I?” riddle describing a particular dinosaur. A couple guys in this group really knew their dinos so it made it easy but still fun (and consistent). Although I struggled with filling time, there were a couple of things I did on the last day that I also think went really well. First, I bought some dinosaur pencils as a thank you gift and attached a hand-written, personalized thank-you note. The notes started and ended the same, but I made sure to include one positive thing that I observed about each person during camp. I hope they read and enjoyed them, but it made me feel good so that is enough for me. The second thing I did was to get feedback from the group. What did you like? What did you dislike? What would you do differently? I got very useful, mature feedback on various things about the camp. Some I’ll be able to use right away. Others, I may forward up the ladder. Honestly, the lego builds themselves didn’t always go very well. There were at least two models that didn’t pay off the builders’ time and effort. They either didn’t work like they were supposed to or broke very easily. I was proud of them for sticking with it, especially since sometimes it was anticlimactic. I should have encouraged them to find ways to make the builds stronger or make changes so that the dinosaurs move better. They were a smart bunch and probably could have made some good discoveries. I already addressed most of this elsewhere but the station play didn’t work with such a small group (or maybe just with this group). The original choices were free play lego building, driving a couple of Meeper Bots, and a LEGO board game. Camp starts with about a half an hour of free building, the Meeper Bots didn’t always work well, and the board game was very basic so I can understand why they lost interest. One thing that actually worked, but I let get in the way was the daily schedule. Everyone enjoyed knowing what was next (they stopped asking after the first day), however, I let the timing interfere. This was especially bad on Wednesday when the guys built the Triceratops. This model moves on its own since the battery is part of the body. This lends itself to all kinds of races and battles but because I allowed myself to be controlled by the times I wrote on the schedule, we missed out on a lot of potential fun. Later in the week, I made the times approximate but kept the order the same. What do you do when things aren’t going quite like you hoped? Do you put a pin in it and come back? Do you elicit feedback? Do you try to make changes on the spot? What do you think of how I handled it? Please, let me know in the comments. I’ve had the opportunity to run my own camp this week. It’s called “Jurassic Bricks” where we build a different dinosaur each day. I had a great group of seven boys who are all experienced lego builders. This means that the builds themselves go by very quickly. This also means that there is a lot of extra time. Although there has been no complaints from the campers, I feel compelled to fill that time. Another reason I feel compelled to fill the extra time is because boys can quickly become rambunctious, and I don’t want to be in a position where I’m constantly telling them “no, you can’t do that.” I think providing a more structured activity option could be the answer. My first attempt at providing another option during their station play/centers did not go over so well. I found, copied out, and printed a bunch of different dinosaur-themed puzzles. I sat and did one to try it out, and one boy took the sheet home. I mentioned a couple of times that they were available, but no one else was interested. It’s also not a very enticing option compared to office chair races (which I immediately nipped in the bud). Each day (except Wednesday, the reasoning of which will be explained in a different post), we have a game before centers. On Monday, we did a relay race. It was a balance skill race and didn’t go very well. It was too easy for most of the boys, except one, which made him feel that much worse I’m sure. On Tuesday, we did lego pictionary where I chose a few different, simple builds. Each builder drew one of my options and tried to get the rest of the group to guess. We even had a round where they each came up with their own idea. I, again, felt like this was too easy and went too quickly. On Thursday, which was my second attempt at filling the time, we played minifigure charades. This game is played with minifigure bingo calling cards (from the bingo game we play each day). There is one guesser while the rest of the group are actors. Each actor is giving clues about the minifigure on the card, while the guesser has three minutes to come up with the correct minifigure character. This went over very well. We played two rounds using some of the easier characters. This game was repeated on Friday. This time, I elicited ideas from the group. I took all of the ideas and wrote them down on the board. We voted on the interest in each one and did our best to make them work. We ended up doing office chair races with specific guidelines, which actually ended up going well. One thing that I added on Thursday that I think helped incentivize group participation were individual points. I had the thought earlier in the week but waited to try it out. Each participant earned points for correct guesses, race victories, battle bot victories, and well-given clues. The final bingo game of the week was “the great equalizer” where the first one to get blackout bingo got five points, the next got four, then three, and so on. The prize for most number of points earned was a dinosaur themed fossil kit. This particular way of earning points with a special prize at the end of the week was great for this particular group. It may not work elsewhere, but I will definitely use it again if the situation seems to call for it. What do you think of my attempts? Is there something I could have done better or different? Is there such a thing as too much structure in a summer camp, or too much down time? Any tips on balancing the two? Please comment below! There are many concrete strategies explained and recommended in Tools for Teaching, but I won’t explain them in full here. Instead, you should really go read the book for yourself. They offer the first chapter for free so you can preview it here. The first of which I feel like I have always used. The author calls this “working the crowd.” It’s the idea of using movement and proximity to manage the classroom. Students are less likely to misbehave if you are nearby. Moving about the room also allows the teacher to check work while the students are doing the work. I’ve used this technique working as an assistant teacher in a preschool, watching students during my college practicum, and now as kids build with Legos. Walking the room like this makes the next strategy easy to implement. This strategy is “praise, prompt, leave” for use during guided practice. Since the campers are guided by the picture instructions of the builds, it’s nearly all guided practice. I include just the praising part of this strategy as I walk so that students know I am there checking their work and available to help, but see they are doing well. When I see a mistake, most students get a simple verbal prompt. I say what they need to do and move on. Luckily, there are visuals to point to if a student seems especially confused. I do stop my route and help those with raised hands, but I still try to prompt them on what to do next and leave quickly. This works very well when other teachers are around to help. I find that it’s important to know the builds and the instructions so that I can see mistakes, help students find them, and prompt them on what to do next. Again, if you’ve been reading my blog, then you’ve also seen me write about and mention “Say, See, Do Teaching.” This is another wonderful strategy from Dr. Fred Jones. It is one that I have included in my script for the first day of camp and that I will be practicing this week. This style of teaching follows with my goal of modeling for my students. I say it; students see me do it; then they do it themselves. Say, See, Do Teaching also focuses on teaching one step at a time. This avoids forgetfulness, cognitive overload, and the endless questions of “what do I do next?” I’ll let you know soon how applying this strategy goes. What are some teaching strategies that you use or have seen? Do any of these sound familiar? Do you practice any of them? Let me know in the comments below. This past week at work was a bit different from my first weeks. I worked Monday through Thursday doing the same build twice each day at different schools with different groups of kids. Each group of kids built their own Ferris Wheel after talking a little bit about the first one built. A post card image of the first Ferris Wheel. I was working with Mrs. J again so we split up teaching roles. I talked about the story, and she went over parts and procedures. On each occasion save one, I asked students if they had ever ridden a Ferris Wheel and what they knew about the very first Ferris Wheel. There were a couple of groups with older students who knew the inventor’s name and that the wheel was named after him. Some groups even knew the when and why of its creation. My favorite answer to why it’s called a Ferris Wheel was some variation of “It’s a wheel that you find in a fair.” It was impressive to see what kids knew and who were likely to raise their hands. However, I most enjoyed treating the story like a read-aloud. It grabbed their attention and got the campers ready to build their very own wheel. If I do this build in the future, I may create a little story book with the information and just do a read-aloud. When it came to explaining the various parts and procedures, Mrs. J followed the same type of pattern but switched it up depending on the age of the group as well as their familiarity with our program. She went over the names of various parts, explained what the colors in the instructions meant, talked about waiting for or helping your partner, and how to get our attention or a part. With some groups she explained the difference between friction and non-friction tech pins, and I think it was a missed opportunity for not repeating ourselves. In the groups that didn’t talk about the difference, I had to let builders know over and over again that they needed to change out the pin they had used for a different one. I think if I follow my say, see, do idea of teaching step one it would make all the difference. Talking about the parts and the colors and the different types of pins would have occurred naturally while students made progress on their build. Step one can also cover counting studs instead of holes, spacing on the base plate, and other types of counting or spacing. It covers two other important procedures— waiting on your partner and pulling parts before building pieces. I really enjoy working with Mrs. J and getting to know her. I also plan on adopting a couple of her ideas. One of which is how students get our attention, which I think I’ve written about before. Students can either raise their hand for help or put their hand on their head for a part. As much as we try to stay organized, pieces tend to travel, break, or go missing. If a kiddo has a hand on the head, then we can help them quickly and move on. 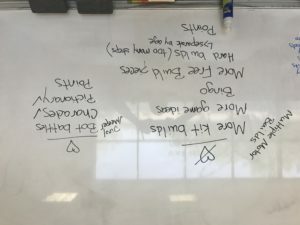 Another idea I like is calling the part list a “shopping list.” It’s simple and cute, but I think it will help reinforce the fact that it’s the first step in each new step of the build process. This particular situation, which I believe we call a “field trip,” doesn’t leave much time for classroom management procedures like I’ve written about before. But, it doesn’t mean you throw everything out the window. There is still room to teach procedures and set expectations. This is something I struggled with last semester and will continue to work on. I didn’t think about it at the time, but I’m glad to have had that opportunity to practice. What do you think about read-alouds versus discussion? When do you use which? Do you have a preference? Do your students? How about Say, See, Do Teaching? Have you ever tried it? Do you model often? I’d love to hear from you in the comments below! I’ve been reading a couple of different books this summer to learn more about classroom management. The book I started with is The First Days of School by Harry and Rosemary Wong. Their secret to classroom management is setting up positive expectations and procedures before moving on to lesson mastery. They also recommend having a script prepared for your very first day of school. This book is why I’ve focused on and frequently mentioned procedures. 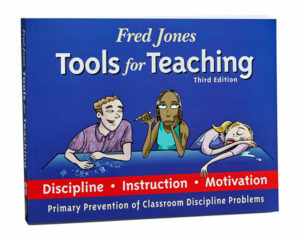 The second book I’ve been learning from is Tools for Teaching by Fred Jones. This book has come from studying “the naturals” and giving specific advice on how to manage a classroom. You have to “mean business” and ease your workload with “say, see, do teaching.” This is where my focus on consequences and follow through has come from. The following is a compilation of the various methods and a rough draft of my “First Day of Camp” script. Welcome! We are so glad you could come build Legos with us. There is an exciting week planned, and I know that each of you will do great! Sales Pitch. Camps all summer, after-school classes (Kyrene, Chandler, Higley, Scottsdale), birthday parties. The consequences are simple: if you do not follow the rules, you do not participate. We want you to participate in everything we have planned for you so let’s not have to worry about it! Both partners need to be finished with the steps before you may turn the page. (Say this while passing out instructions). When you’ve gotten your kit and instructions, you may begin. Today, we will start together. (Say this while passing out kits). Okay, everyone open up to the first page (<-say, I do what I say, and continue to model and explain). Start with the lowest number. Pull out the pieces first (students do), then study the picture to do the build. The colors don’t match the pieces in your kit, but they do match each other from parts to picture (usually). Look carefully and count your spaces. When you are finished, you can add to or modify your build. Change the gears to see if you can make it go faster. Can you make it more stable? Can you make it look cooler? Okay, it is time to clean up! Go back to your original station (students do). Check the floor around you for pieces that might have fallen (students do). Let’s look at the chart on the box so we can put things away correctly. (Model and have students start breaking down their builds). Have it checked by a teacher. Snack/outside procedures <- discuss these after the builds are finished. Respect property and others. Clean up your trash, leave the plants alone. Remember to be careful when playing so that no one is hurt. What do you think of my script? If you’re a teacher, do you do anything like this on your first day of school? Have you read either of the books I mentioned? If so, what are your thoughts? Please leave a comment below to let me know what you think! But to a five year old…? What does respect mean? What does it look like? What do you consider good manners? Who should I listen to, and whose directions should I follow? Do I really need to clean up if I didn’t play with that? If I can see the teacher, is that good enough? Those are just a few examples off the top of my head, and all things that concern me. I wrote previously about picking and choosing which aspects of respect to teach, but I’m also concerning myself with how. In my training as a pre-service teacher, I’ve been told to use examples and non-examples to teach a behavior. Let’s use “respect the equipment” as our guide. What does that look like? Placing legos gently back into boxes and picking them up off the floor immediately so they don’t get stepped on and broken are good places to start. A non-example or what disrespect looks like is throwing legos across the room or throwing them haphazardly into boxes. So my next question is, how should I teach that? Do I give the kids a chance to contribute and come up with those ideas? Or, do I ask them yes/no questions about how we should handle the equipment? For time’s sake, I think the latter is better, but does that constitute any actual learning about behavior? I’ve just spent an entire paragraph on a single aspect of a single rule. How much time does that take in a classroom with 10-15 kids? Although there are rules, there don’t seem to be any consequences. Kids who are running around the room or play a little too rough during break just get talked at. (I use at instead of to because I really can’t see a lot getting through). When it comes to respecting equipment and everyone cleans (the R and E in Mr. K’s RULES), things go mostly okay. However, we still have to tell different kiddos in various frequencies to pick legos up off the floor, be careful with the motors, or please help finish cleaning. I don’t really want to spend the first 20 minutes of class going over rules, respect, and consequences, but it may be worth it so that the week runs smoothly. I think it may be especially important since the rules were only briefly explained on the first day of camp (and never really reviewed). The meaning of respect runs deep, and the specifics of the rules can be complicated; but I think the consequence of not following the rules is fairly straightforward: if you can’t follow the RULES, then you can’t participate. I tried that consequence with a somewhat disastrous side effect. A little boy (maybe 7) was messing with a plant outside that we said he needed to leave alone. He ignored his name being called and both teachers saying to leave the plant alone. I called him over and told him he needed to sit out of the game since he did not listen. Out came the wailing and crying, even though not a single crocodile tear fell. It made me look bad, and there was no support since consequences were never discussed or previously used. I feel like if a quick conversation about consequences had happened at the beginning of the week from the lead teacher, then the boy who cried wouldn’t have had much use for it since he was told the result of his actions before they ever happened. There was finally an instance in this same camp where the lead teacher mentioned not being able to participate in the next activity if he didn’t get everyone’s attention. It was barely effective and won’t be in the future because there was no follow through (from him. I did have a camper sit out one round for not following directions). I understand that it’s summer and that this is not an official classroom, but I still think you need to say what you mean and mean what you say. For any parents or teachers who may be reading this, what do you think about my expectations? Are they too much for this type of summer camp/after school program? Is it just enough to make the week run smoothly? Do you have any advice or suggestions? Please leave a comment below to tell me what you think.